LONDON (AP) — Thousands of people on two continents picked up the baton from the United States and rallied Sunday in solidarity with women demanding equality, justice and an end to sexual harassment. Demonstrations in London, Paris, Sydney and other European and Australian cities followed much larger women’s marches held Saturday across the U.S. to mark the anniversary of President Donald Trump’s inauguration, as well as the protests it inspired. In the British capital, demonstrators carried placards reading “We Are Powerful” and “Time’s Up” and chanted outside Prime Minister Theresa May’s office as they raised grievances ranging from workplace inequities to misogynistic abuse on social media. The London event drew thousands of people despite sleet and snow. Heavy rain fell on the protesters who gathered near the Eiffel Tower, which could have been a factor in the small number of participants compared to the U.S. marches on Saturday. The international events come at a time of reckoning for many men in Hollywood, the media and other industries as women speak out about sexual misconduct and inequity in general. More are scheduled to take place in the United States on Sunday. They will culminate in a Las Vegas rally that will launch an effort to register 1 million voters and target swing states in the U.S. midterm elections later this year, which could shift control of Congress. The march in Washington, D.C., on Saturday took on the feel of a political rally when U.S. Sen. Kirsten Gillibrand on New York and Rep. Nancy Pelosi of California, both Democrats, urged women to run for office and vote to oppose Trump and the Republicans’ agenda. 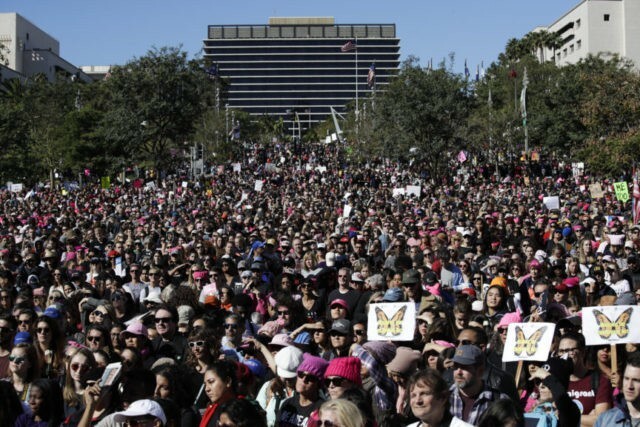 In Los Angeles, Eva Longoria, Natalie Portman, Viola Davis, Alfre Woodard, Scarlett Johansson, Constance Wu, Adam Scott and Rob Reiner were among the celebrities who addressed a crowd of hundreds of thousands at the women’s march there. Cohen reported from Los Angeles and Lush reported from in St. Petersburg, Verena Dobnik in New York, Sylvie Corbet in Paris, Chris Blake in Sydney and Jo Kearney in London contributed to this story.